The S3ADSIQ19M14BSM55LL is an ultra-low power and compact Dual-Channel 14-bit SAR ADC IP with a sampling rate up to 19.2MS/s per channel. 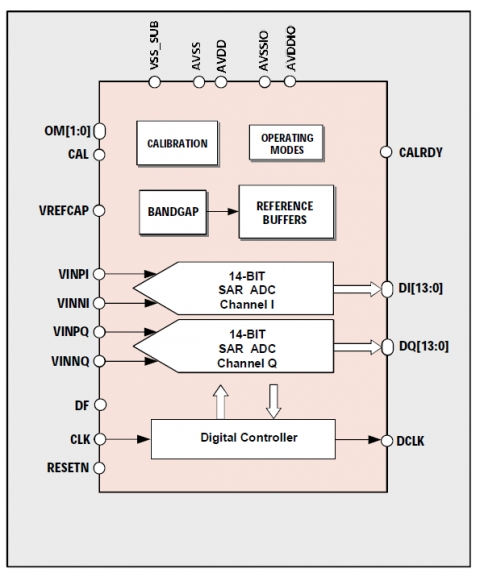 This 14-bit I/Q ADC features an outstanding performance that includes > 76.0dBc SFDR, 74.0dB SNDR and 12.0-bit ENOB. It also features an outstanding Cross-Channel performance with < 0.2dB I/Q Gain Mismatch and < 0.1deg I/Q Phase Mismatch.